Over the past few months MERL has been working with an organisation called Basketry & Beyond, who have recently received a HLF-grant for a project to preserve and promote the heritage of basketry in the South West. This includes a Festival at the Dartington Estate in Totnes, Devon, in May to celebrate all aspects of basketry, with a focus on the themes of fishing, farming and fashion. 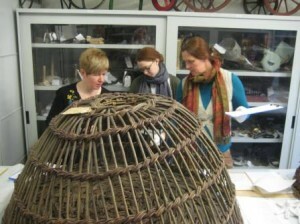 Yesterday six members of Basketry & Beyond came to MERL for a research visit to look at some of the baskets we have from the South West (the cataloguing work done as part of the Sense of Place project on the basketry collections means it was easy to identify this material – see an earlier post). The group were particularly interested in the types of baskets that are typical of the South West, rather than individual baskets that were made, used or acquired from the area but are not typical of the region. This included lobster pots and stores, Tamar chip baskets, Devon splint baskets, and salmon putchers. This research will be used to produce fact sheets about the history and heritage of the regional baskets, and will feed into an exhibition at the Festival. This lobster store (MERL 64/206) was a lot bigger than I was expecting! We had a great day in the MERL stores. As well as having the baskets out to examine (some of which were surprisingly large) we had lots of books, pamphlets, magazine clippings, and photos from the MERL Library and Archives. There was a lot of sharing of knowledge – both ‘peer-to-peer’ between basketmakers (as everyone had their own area of expertise), and ‘specialist to non-specialist’ between the basketmakers and Ollie, Felicity and me ­– and plenty of exchanging of notes, articles, etc. Both sides now need to collate this information in meaningful ways – Basketry & Beyond for their fact sheets, and us to input into and disseminate via the online catalogue. As well as being able to gather lots of useful information for the Festival, hopefully the session also gave Basketry & Beyond an opportunity to gain experience in researching and recording relevant information which they can use when visiting other institutions. We’re hoping to run this type of session again with other basketmakers to find out more about our basketry collections, particularly those which came in after 1970 and have never been examined by a basketmaker, so this was a good opportunity for us to figure out how what works well – the numbers of people it’s practical to work with, the number of baskets it’s possibly to look at in a day, the best way to record the information and feed it back into the catalogue, the things we need to have access to while working (the online catalogue, a scanner, a photocopier etc.). You can find out more about the Festival on the Basketry & Beyond website and their Facebook page. 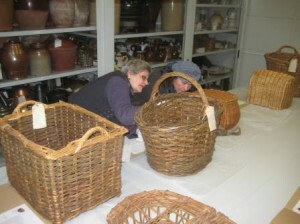 You can find out more about the baskets we looked at yesterday by visiting our online catalogue. 60/442 (Hive, skep; Basketwork); 60/444 (Basket, bird – ‘fowl crate’); 64/22 (Trap, salmon – ‘putcher’); 64/23 (Trap, salmon – ‘putcher’); 64/206 (Store, shellfish – ‘lobster store’); 64/207 (Pot, shellfish – ‘lobster pot’); 64/216 (Basket, fish – ‘maund’); 64/217 (Strainer, bilge; Basketwork); 65/284 (Pot, shellfish – ‘prawn pot’); 66/266 (Basket, fish – ‘cowel’); 66/347 (Basket, vegetable – ‘chip basket’), 66/348/1–2 (Basket, vegetable – ‘chip basket’); 68/92 (Basket, picnic; Bag); 68/561 (Basket, angler); 69/196 (Basket, vegetable – ‘black basket’); 71/224 (Basket, fruit; Basket, vegetable – ‘Worcestershire pot’); 91/38 (Basket, feeding; Basket, potato – ‘Devon splint’); 96/118 (Basket, feeding; Basket, potato – ‘Devon splint’). The Crab/Lobster pot known as a Withy pot is made in mainly 2 sizes; full size inkwell for the catching of the crab (standing about 2 feet tall and about 26/28″ base), to nearly twice this for a Store Pot which is used as the name say’s for putting the crab in until you have enough to land. Sizes however, can vary depending on the ground you are fishing. In years gone by when the inshore catch was good, the pots were made on the large size. However, as catches went down, some made their pots smaller which meant a saving on materials and time making them. It can take 4-5 hours for one man to make a full size pot; families would always work together in the making of the pots. My Grandfather would make the basic frame and my Uncles would turn the bottom in – working this way, they could make 4 pots a day. (later changing to a pot mouth made from plastic), these pots were a lot quicker to make. Now the parlour pot and inkwell pot are made from man- made materials and can last for many years compared to at most one to one and a half seasons at best. Thanks for the info on the lobster/crab pots and stores. I’m going to work on putting the additional information we learned from our Basketry and Beyond visitors into the catalogue over the next few days, so this is really helpful. Are the pots known as ‘withy pots’ throughout the country, or just in Devon? And are there many people who still know how to make them? As far as I know the pots were called Withy Pots more or less everywhere, the style of the pots however change slightly from location to location, the Cornish pot’s spiral tends to go anti clockwise and the Devon one clockwise. Also the way I and my family turn the bottom of the pot in is different to other areas, I start from the centre and work out and others start from the outer ring and work in, as far as I know this is unique to the area of Budleigh Salterton and the immediate surrounding area. At the event you will see the 3 of us working and each will be slightly different. I believe there are only about 6/8 of us who now still make these pots in the country, after I am gone that will be it from my neck of the woods! p.s. this is not with a view to making them commercially, just to try a few and if one or two turn out, exchange them with the fisherman for a few lobsters. We live in Brighton.